Kegco's K309SS-2 Two-Tap Digital Beer Keg Dispenser has all of the features you've come to love in our other high quality Kegco models, now with new innovations like a digital temperature display with push button controls, fan-forced cooling, and one of the widest available temperature ranges on the market! It is easier than ever to monitor and adjust your kegerator's internal temperature with digital temperature controls. 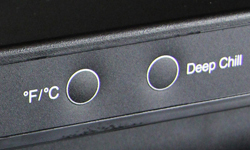 Unlike with manual temperature dials, where you often have to guess what temperature an adjustment will produce, you can simple press these up or down buttons to adjust the temperature by one degree. It can be set to display either Fahrenheit or Celsius, and the temperature can be set as low as 32 degrees to dispense ice cold beer. The K309SS-2 also features a Deep Chill function that allows you to quickly cool down a warm beer keg by forcing the compressor to work continuously for 24 hours. When the desired temperature has been reached, pressing the Deep Chill again will return the unit to normal operation. This K309SS-2 Draft Beer Dispenser is designed for freestanding use, and has a matte black finish on the sides with an elegant stainless steel door. It comes complete with a direct draw dispense system for dispensing up to two D system domestic kegs at a time, and is packed full of convenient features like a removable easy-to-clean drip tray and a chrome guard rail that prevents glasses from sliding off the top. 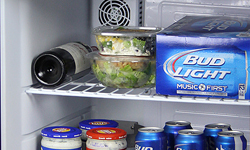 Easy-roll casters make it easy to move your kegerator to wherever room the party's at, and they can be locked once the unit is in place to prevent it from moving again until you need it to. The interior of this K309SS-2 Beer Keg Cooler is spacious enough to accommodate any full size keg, including Miller kegs, Coors Kegs, and rubber kegs. It can also hold up to two 5 Gallon D System kegs or up to three 5 Gallon Cornelius Ball Lock Home Brew kegs, allowing you to dispense up to two kegs of beer at a time. When you're not using this unit to dispense kegs, you can easily convert it into a regular all-refrigerator or beverage center for extra storage. The two included adjustable shelves can be spaced far enough apart to hold 2-liter bottles or gallon jugs, and thanks to the Kegco K309SS-2's wide temperature range, you can even use it to store wine! 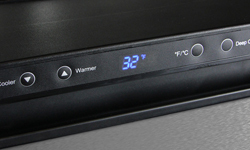 Say no to a manual dial and enjoy this digital temperature control. Thanks to the digital display, you can easily view an accurate reading of your kegerator's internal temperature in Fahrenheit or Celsius. Where a manual dial would require you to guess the approximate temperature you were adjusting, this kegerator features intuitive up and down controls that can adjust the temperature in 1 degree increments. 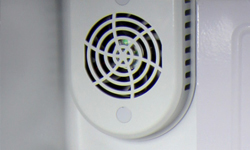 The K309X-1's temperature can be set as low as 32°F or as high as 75°F. Kegco's K309X Series utilizes fan forced cooling to ensure even, consistent cooling throughout the cabinet and to give you one of the coldest temperature ranges of any beer refrigerator on the market. Set the temperature as low as 32 degrees to dispense your delicious ice cold brew, or set it high enough to use it as a fermentation chamber. This kegerator's spacious interior easily accommodates any full size keg (including Coors Kegs, Miller Kegs, and rubber kegs! ), as well as up to two 5-Gallon D System kegs or up to three 5-Gallon Cornelius Ball Lock Home-Brew Kegs. 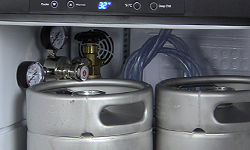 This allows you to tap one keg while keeping two more cool and ready to dispense. If you are using the keg cooler as a fermentation chamber, it will fit a 6 gallon bucket or carboy with ease. The Deep Chill function quickly cools your warm beer so you can have more time to enjoy refreshing cold home-brew beer! A simple push of the Deep Chill button causes the compressor to kick in for up to 24 hours to cool your keg to the desired temperature. Press the button again, and the kegerator is returned to its normal operation. Only have a pony size keg? Not a problem! Not only can this multi-purpose kegerator be used for dispensing and fermentation, but it also comes with two adjustable shelves that allow you to convert it into an all-refrigerator, providing extra refrigerated storage for food and beverages. The shelves can be spaced far enough apart to hold 2-liter bottles and gallon jugs, and you can even store wine thanks to the wide temperature range. Invite your guests over to enjoy delicious kegged beer in any room of your home! The K309X-1's easy-roll casters allow you to bring the kegerator right to them. 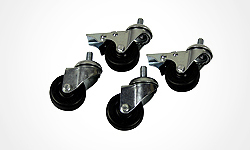 These casters can be locked down once the kegerator is in position, so it won't roll away again until you need it to. These keg beer dispensers have all the equipment you'll need to dispense a delicious glass of cold draft beer. The single tap draft beer dispensing system includes a Draft Tower with one Faucet, a CO2 Cylinder, a Regulator, and a Keg Coupler, which can all be customized for a setup that's just right for you.